WASHINGTON -- A United States Senate committee on Tuesday approved President Donald Trump's pick for ambassador to South Korea, paving the way for his confirmation. 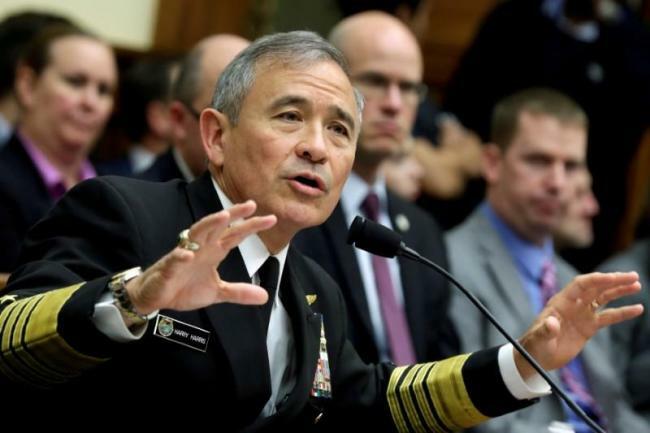 Retired Adm. Harry Harris was tapped by Trump last month to fill a post that has remained vacant since the administration took office early last year. The former chief of the US Pacific Command won unanimous approval from the Senate Foreign Relations Committee ahead of a full Senate vote expected for early July. "I believe we should give exercises, major exercises, a pause to see if Kim Jong-un is in fact serious about his part of the negotiations," he said, referring to the North Korean leader. "Today, following the summit, we are in a dramatically different place." Trump and Kim met in Singapore on June 12. The Navy admiral was born in Japan to a Japanese mother and American father. He led the US Pacific Command in Hawaii for three years until last month, with oversight over the 28,500-strong US Forces Korea.